Babbage claimed that he was born in London on December 26, 1792, though his biographer lists his birthplace as Devonshire in 1791. He was privately educated until he entered Cambridge University in 1810 where he studied mathematics and became interested in astronomy. In 1813 Babbage and other mathematicians formed the Analytical Society. Their purpose was w further the study of abstract algebra and to introduce mathematical developments from Europe into Great Britain. Babbage also helped to found the Royal Astronomical Society in 1820. In 1822 Babbage outlined his ideas concerning a “Difference Engine” intended to mechanize the process of computing astronomical tables. 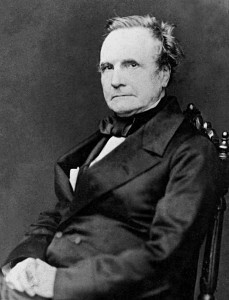 Babbage gained financial support for the project from the British government. It is common today for scientists and inventors to apply for government grants, but this was not the case in his time. The government hoped that accurately calculated star tables would help save lives by improving navigation on the high seas. Unfortunately, Babbage had underestimated the size of the project. He reportedly suffered a breakdown in 1827, ceased working on his machine in 1833, and nine years later the government cancelled its support. A Stockholm printer, Pehr Georg Scheutz, improved Babbage’s design and built a working version of it in 1855. The Difference Engine is not the machine for which we remember Babbage. In 1833 he began working on his Analytical Engine. Babbage adapted elements of the Jacquard weaving loom to use in his calculating machine. The loom employed a set of instructions read from punch cards; they told the loom which operations it had to perform and which color thread to use. Babbage saw that this could be applied to scientific computation. The operations could be input on punch cards and the values on which operations would be performed could be stored in registers. Mathematician Augusta Ada Byron, Countess of LOVELACE, collaborated with Babbage on programming the instructions for the Analytical Engine and helped to fund his endeavor. Unfortunately, Babbage never built this machine. He died in London in 1871 and his notes were lost until 1937. In 1842 Lovelace translated a paper written by an Italian engineer (who had seen a model of the engine) explicating its design; she added numerous notes and explanations of her own. This paper is the only writing by LOVELACE concerning the Analytical Engine to have survived. In 1991 British scientists used Babbage’s specifications to build a working model of the engine; it has been performing accurate, simple calculations since then. Babbage is considered to be the grandfather of the modern computer; his early ideas for mechanical computing machines led to the development, 100 years later, of the first full­scale, automatic devices. More immediately, the punch cards he designed for the Analytical Engine led to other inventions, and he was influential in the development of the field of mathematics in Britain. Babbage’s efforts at the Analytical Society brought GOTTFRIED LEIBNIZ’s notation to Britain. After a dispute between the followers of Leibniz and ISAAC NEWTON about who had invented the calculus, the British used Newton’s approach for over 100 years. However, Leibniz’s approach and notation were more accessible and easier to use. After the Analytical Society successfully introduced Leibniz’s notation, the work of other scholars who used Leibniz’s notation became accessible to students in England for the first time. Not just a mathematician, Babbage was an inventor of great imagination, and his inventive use of punch cards in the Analytical Engine resonated in other fields. For instance, musical instrument makers began using punch cards to replace barrel organs. An automatic organ, like a player piano, could generate any tune encoded on an interchangeable stack of cards or replaceable, perforated paper roll. Babbage’s Analytical Engine was the predecessor to the Mark I, a computer built more than 100 years later by HOWARD AIKEN. Aiken knew of Babbage’s designs and, in 1944, was the first U.S. engineer to build a full­scale workable computer that could be controlled by a program. Aileen and other computer engineers of his era found inspiration in Babbage’s adaptation of punch cards: Aiken used punched paper tape as the method of feeding the program into the Mark I. Many other computers of the mid­1900s, even full­scale electronic ones, would use punch cards and/or tape to input data or instructions. Posted on March 4, 2015 by Natalie. This entry was posted in Inventors, Mathematicians and tagged automated computing machine, modern computer. Bookmark the permalink.